On 4-5 December, the City of Vienna hosted the “Housing for All” Conference, a forum to present a European Action Plan to implement concrete policies for the right to housing. The gathering also kicked-off a campaign by European cities to put housing high on the agenda of the upcoming European election. Vienna, Barcelona and Lisbon, as promoters of the initiative within the Cities for Housing global movement, saw the support of the UN Special Rapporteur on the Right to Housing, Leilani Farha. The Conference also offered the chance to participants to have a first-hand impression of the Vienna model of social housing as a public service. Global financialization of housing has left tenants unprotected: as the UN Special Rapporteur on Adequate Housing, Leilani Farha, put it, “while governments have abandoned tenants, they have not abandoned investors. Residential real estate is the world’s biggest business: 163 trillion dollars – almost three times the annual world GDP”. In Europe, housing speculation has caused skyrocketing costs: rent already is European’s households’ main expenditure, and 82 million citizens are overburdened by housing costs". In this context, the City of Vienna hosted the “Housing for All” Conference to call on EU institutions to provide a regulatory framework that ensures cities have enough competences and resources to guarantee the right to housing through social housing schemes. “We cannot leave housing to the market: it is too important for human life. After all, the market will never supply all strata of the population with affordable housing. Us cities need adequate conditions to provide social housing to all”, stated Michael Ludwig, Mayor of Vienna. The Conference was the occasion to kick off a campaign led by European cities to transform the Cities for Housing movement into regional motion, and to put issue of housing high on the agenda for the upcoming elections to the European Parliament. As Laia Ortiz, Deputy Mayor for Social Rights of Barcelona affirmed, “It is now time to translate the global movement for the right to housing into European strategy. We count on Vienna, as a leading city in the fight for the right to housing, and with many other cities that are demanding to make the shift to housing as a human right”. Rui Neves Bochmann Franco, Deputy Councillor for Housing of Lisbon also attended the conference to reaffirm its city’s commitment with social housing. Vienna, Barcelona and Lisbon are among the European signatories of the Cities for Housing Declaration, which has also gathered other supports in the region: Amsterdam, Berlin, Bologna, London, Manchester, Mannheim, Paris, Plaine Commune, Rennes, Terrassa and Zaragoza (full list here). All cities are invited to join the Declaration of Cities for Housing – should you wish to do so, kindly email citiesforhousing@uclg.org. During the Conference, the City of Vienna further presented the outcome of the 3-years’ work carried out by the European Housing Partnership – a working group within the framework of the European Urban Agenda for enhanced affordable housing policies. The result of this work is an Action Plan that includes 12 concrete policy action on the fields of housing regulation; knowledge and governance, and funding. During the Conference, member stakeholders of the Housing Partnership called on the EU to contribute to the efforts for affordable housing by providing adequate legal and financial instruments, as well as a sound monitoring of developments on all spheres of governments. 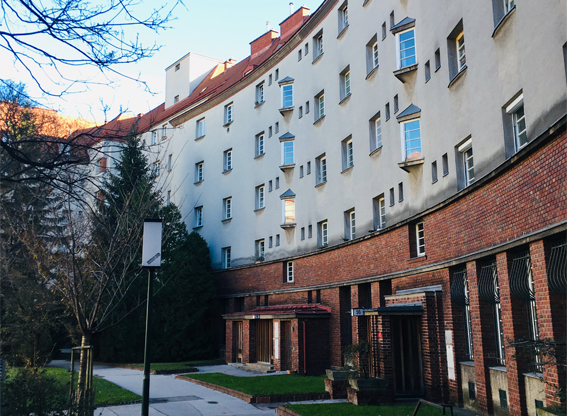 During the second day of the conference, participants were offered the chance to visit social housing estates to get a more practical impression of what the Vienna’s approach to housing as a public service is translated into reality. The city’s public scheme was initiated during the “Red Vienna” city government (1922-1934): during the interwar period, the City Hall responded to poverty and refugees’ influx by launching a large-scale programme of housing construction. An example of these early social estates is the Rabenhof complex: at the time of its construction (1927), residents’ expenditures on rent was limited to 4% of their income. Nowadays, the community of Rabenhof can rely on a public kindergarten, library and theatre within the estate, among other facilities, and rents are still one-third cheaper than those of the private market. 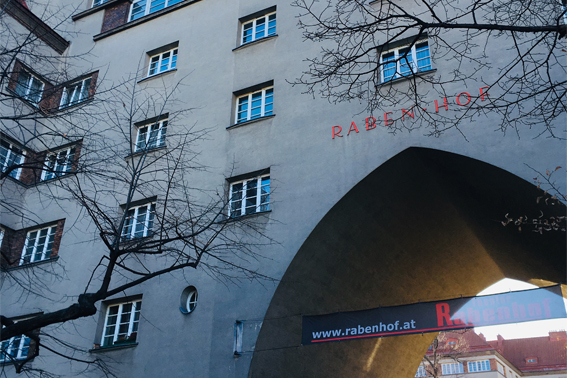 Such decades-long social housing policies have resulted in 62% of Vienna’s population living in subsidised dwellings – i.e., 220.000 municipal houses and over 200.000 subsidised flats. Cities for Housing website. To join the Declaration as a signatory city, please email citiesforhousing@uclg.org. Action Plan of the European Housing Partnership.